1. First, you will prepare the beef stock. Place all of your meat in a large pot of water and bring it to a boil. Boil it for around 3-5 minutes. Pour out your water and empty the pot of your meat. You’ll see a brown frothy, even scummy layer built up on the edges of your pot – wash your pot clean of that froth. 3. While you wait for your stock to stew, you can prepare your vegetables and bouquet garni. For my carrots, I like leaving about an inch of the green stalks on them and cutting them lengthwise before chopping them into smaller coarse chunks. Everything can be coarsely chopped. Stick your four cloves into the centre of your onion quarters. 4. Add your leek, onion (with the cloves), bouquet garni, and salt into your pot and continue simmering. If you aren’t using whole cloves, you can add your ground cloves in at this point. If you are using your thermal pot, remember to bring your stock back up to a boil before placing it back into the thermal pot. 5. About 45 minutes before you’re ready to serve your pot au feu, add the remaining carrots and turnip to your stock. 6. Take your sirloin and pan sear it on medium-high to high heat in a frying pan, depending on how cooked you like your meat (lower heat if you like it cooked through more as it takes longer to sear). When it’s done, pour the juices from the meat into your stock, and cover your sirloin with a bit of tinfoil and let it rest for about 5 to 10 minutes, depending on how thick your cut of meat was (longer for thicker cuts). Cut your sirloin either into strips or cubes. 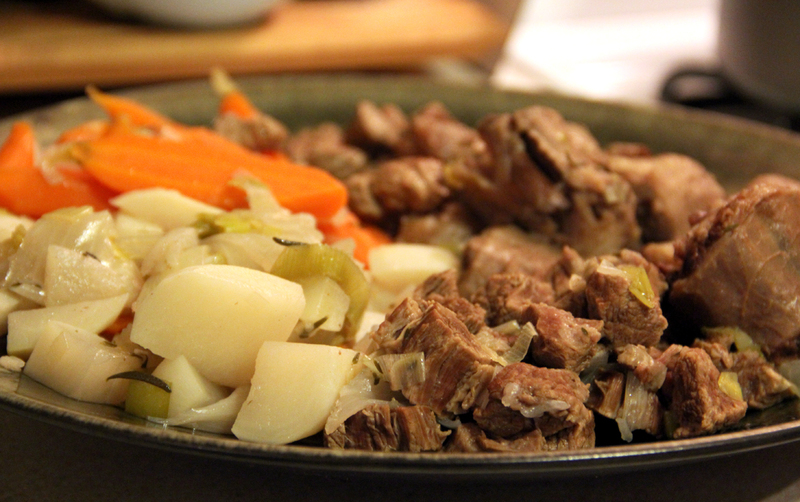 Plate it on a large platter if you want to serve your pot au feu communal style. Plate it into your soup bowls if you aren’t planning on serving it communal style. 7. Remove the chunks of meat from your stock and also cut that meat into strips or cubes. If you’re using brisket, cut it against the grain. Also plate this meat, along with the oxtail and or bone marrow, on the platter. If you don’t want to serve your pot au feu communal style, place your meat back in your stock and skip the next step. 8. Remove and discard your bouqet garni. 9. Remove your vegetables with a slotted spoon and also plate your carrots, turnips, leek, and onions on your platter for serving. 10. Your family or guests can help themselves to whatever meat and vegetables they want in their soup bowls. Ladle in the stock over their meat and vegetables. This entry was posted in Mains, Soup and tagged beef, French, pot au feu, soup, stew, stock. Bookmark the permalink.